What would you do if you had an extra pair of arms. If you were Machamp, the answer would probably be "flexing a lot and punching things sometimes". And hey, if you're going to excel in something, might as well go all out, right? 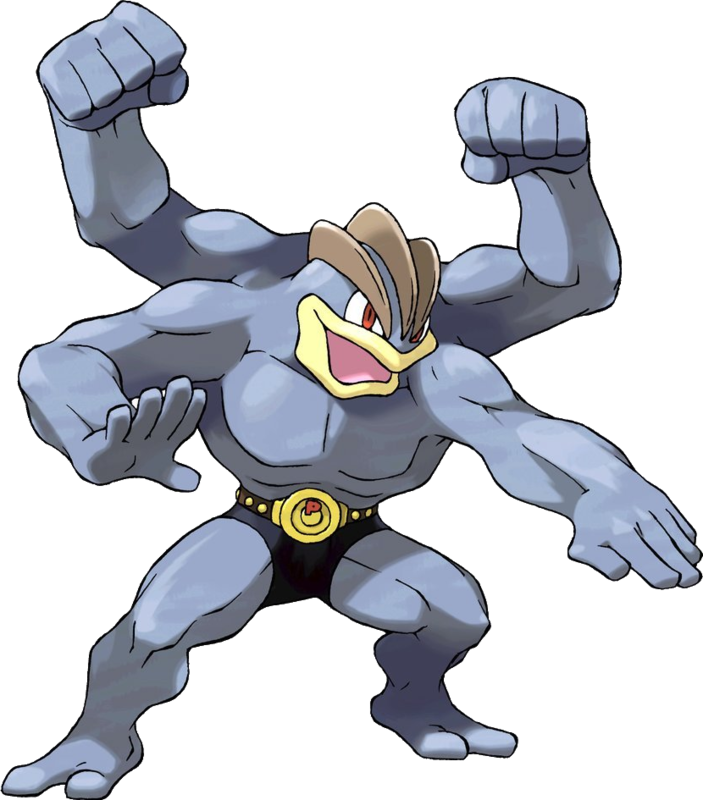 Machamp has the second highest Attack in the game, and learns a variety of Fighting and Normal-type moves to showcase that extra brute force. HP and Defense are not bad, though Machamp is pretty darn slow, and its Special is below average, though among the best for a Fighting type. And it's also got Pringles for hair. That's gotta come in handy when you have the munchies. A Generation I Machamp really shouldn't vary from the following moveset: Submission, Double-Edge/Hyper Beam/Karate Chop, Earthquake and Rock Slide. The latter two can at least attempt to deal with Machamp's weaknesses--Psychic and Flying, respectively--and while Earthquake doesn't cause supereffective damage against Psychics, most have poor defense, so you can at least get a lil somethin' somethin' out of the deal. The only real choice you'll have to make is with your Normal-type attack. Do you want one that sends back recoil damage to you? Or perhaps you want one that takes a turn to charge but is the most powerful once it attacks on turn two? Or maybe you want the weakest one, but one that almost always gets a critical hit? The options really are endless! Other fun facts about Machamp: It used to be called Ju-Doh during the Pokemon Red and Blue Beta, and in Pokemon Yellow you can trade a Cubone (go back to your dead mother, Cubone) for a Machoke, which then immediately evolves into Machamp. Score.